For every four things that come out of Trump’s mouth, we’re treated on average to three lies for every truth. 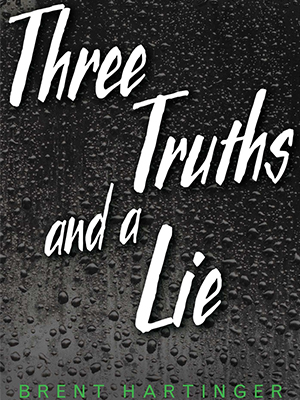 So how refreshing to read Brent Hartinger’s new novel, Three Truths and a Lie. That’s a much more respectable ratio. Even better is that this gay thriller is such a fun and suspenseful read. The plot follows four friends who’ve gathered for a final pre-graduation celebration at an isolated cabin by the lake. When their only mode of communication with the outside world disappears, they decide to play the ever-popular game, Three Truths and a Lie. As the game progresses, the stakes grow increasingly intense. And dangerous. Part horror novel, part mystery, part coming-of-age story, it’s a fast-paced read from Lambda Literary Award and GLAAD Media Award-winner Hartinger, whose first novel, Geography Club, was made into a feature film in November 2013. Whether you’re looking for an ideal beach read or something to make time pass faster on a long-haul flight, Three Truths and a Lie is the book for you, effectively making “gay psychological thriller” the genre you never knew you needed.